adidas Originals is excited to announce a collaborative project with Toei Animation and its iconic international anime series, Dragon Ball Z. Since 1989, Dragon Ball Z has transcended the world of anime and manga, reaching global icon status within contemporary pop-culture. The collaboration sees three of the most iconic battles between heroes and villains throughout the anime re-imagined in sneaker form. Following the Dragon Ball Z chronology, the collaboration features seven silhouettes from the adidas Originals roster, carefully chosen to represent the characteristics of the heroes and villains to which they refer. 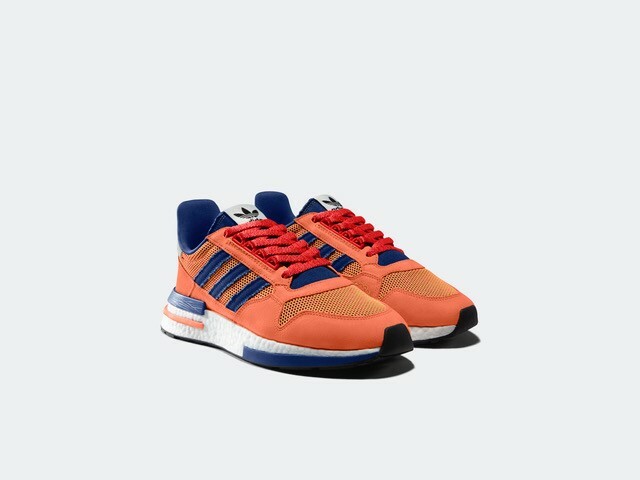 Kicking off with the legendary battle between two of Dragon Ball Z’s most recognizable faces, Son Goku and Frieza, the collaborative project begins with the ZX 500 RM and Yung-1 respectively. Following this, the project moves to Son Gohan and Cell who are depicted in sneaker form as Deerupt and Prophere. Representing the final battle in the project, the Ultra Tech and Kamanda silhouettes are made-up in the image of Vegeta and Majin Buu. With the culmination of all 7 Dragon balls, the collaboration will be finished with the appearance of Shenron the Dragon, which is re-imagined as the EQT Support Mid ADV PK. Each release will include two silhouettes (one hero and one villain), dropping monthly from September to December. The shoes will be presented in special collaborative packaging featuring an individual Dragon Ball detail, each box coming together to create a singular back cover design – a homage to the tapestry-like images found on the spines of the original Dragon Ball magazines. Re-affirming a relentless commitment to collaboration and creativity, the project positions adidas Originals at the forefront of global popular-culture, uniting classic adidas design with one of the most beloved animated series of all time. “adidas is an exceptional partner and it’s been a delight working with their creative team to bring this exciting collaboration to life,” said Masayuki Endo, President of Toei Animation Inc. “Their artistic vision adds a new chapter to the ongoing story of Dragon Ball’s merchandising success and we can’t wait for fans to discover what’s been created.